Back in July Huck Gee x BAIT presented the world with SKULL SQUADRON ROBOTECH ARMOR CYCLONE HUNTER! NOW for New York Comic Con the nod to Robotech will be unleashed and all armoured up and ready to defend at will! Now in the green visor and hints of yellow, worthy to battle the crowds at NYCC to grab one. We think so, especially if you’re a Robotech Macross fan. BAIT and legendary toy designer Huck Gee come together to reimagined the iconic Armor Cyclone for Roy Fokker in the Robotech Macross saga. 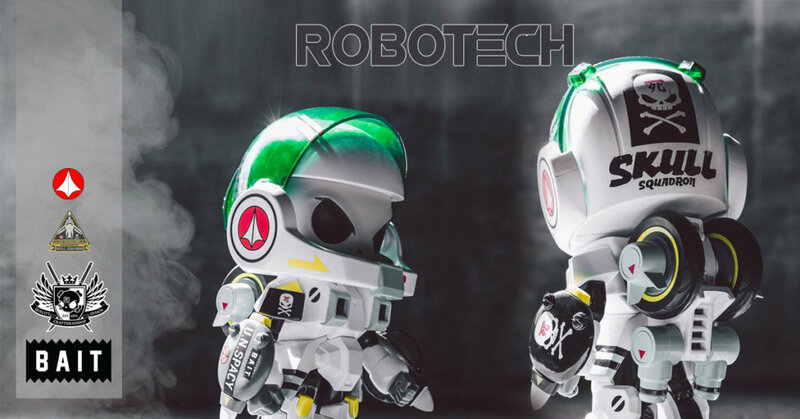 The BAIT x Huck Gee x Robotech figure will be available starting this Thurs 10/4 at New York Comic Con via first come first serve. Visit BAIT at Booth 220 to purchase. Way back in Feb 2017, Huck was working on these designs as per his Instagram post HERE. We are super hyped to see these come to fruition!